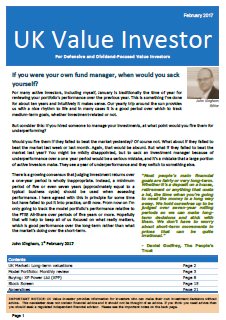 Is the UK stock market cheap or expensive compared to historic norms? And are its returns over the next decade or so likely to be good, bad or ugly? 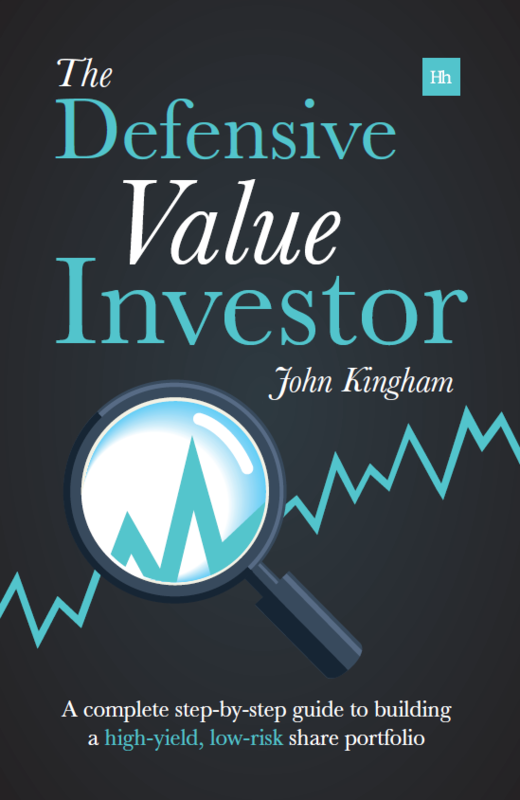 To find out, I’m going to look at the current valuation of both the FTSE 100 and FTSE 250. After that I’ll wrap things up with a long-term forecast for both indices. Expensive or cheap compared to what? 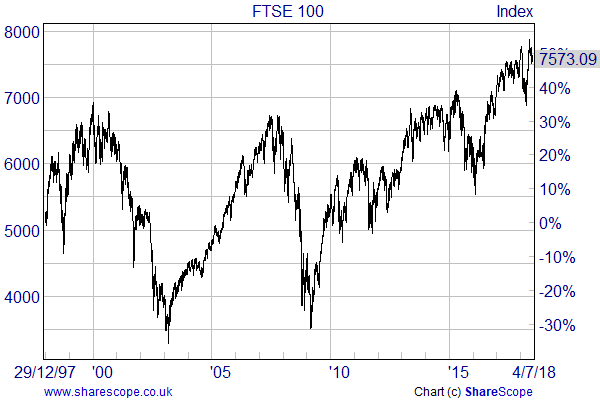 The FTSE 100 is close to an all-time high. Does that make it expensive? For the price of something to be expensive or cheap you need to something else to compare it to. Many people compare the price of the FTSE 100 to its price last week, last month or last year; but that’s a really bad idea. A much better idea is to compare price to earnings. When I looked at the UK housing market last week, I compared average house prices to average UK worker earnings since 1983. That’s a sensible approach and it can be applied to the stock market in almost exactly the same way. This is easy to do because the price to earnings (PE) ratio for both the FTSE 100 and FTSE 250 are published on a daily basis by the FT in its World Markets at a Glance report. There is a snag though. With the housing PE ratio, earnings are very stable because the average wage in the UK hardly changes from one year to the next. And that’s good because you need to compare prices to something that’s consistent over time. But corporate earnings aren’t consistent from one year to the next. For example, at the start of July the FTSE 100 stood at 7,637 with a PE ratio of 13.33. So the index had earnings of 573 index points. In contrast, at the start of 2017 the index stood at 7,120 points with a PE ratio of 33.6, so its earnings back then were just 212 index points. That’s an earnings increase of more than 150% in 18 months, which means year-to-year corporate earnings are very volatile and largely useless for valuation purposes. Fortunately there’s an easy way to remove most of this volatility, and that’s by averaging earnings over a ten-year period. The result is the PE10 ratio, although a more popular alternative is the inflation-adjusted version, commonly known as CAPE (cyclically adjusted PE). When CAPE is far above average, stock market returns over ten to 30 years or so are likely to be far below average. When CAPE is far below average, returns over ten to 30 years or so are likely to be far above average. When CAPE is about average, returns over ten to 30 years or so are likely to be about average. In fact, it’s pretty easy to come up with standards for “expensive” or “cheap” based on the historic CAPE record for the FTSE 100 and FTSE 250. We can then compare where the indices are today compared to those historic standards. Over the long-term, across many markets, CAPE tends to stay somewhere near the mid-teens. In the UK, since the mid-80s, it’s been as high as 30 and as low as 10. Its average over those 30-odd years is about 18, although I tend to assume the longer-term average is 16 because the last 30 years includes the biggest valuation bubble in recent history (the dot-com bubble of the late 90s). Here’s some context: In the great dot-com bubble, CAPE was about 32. In other words, investors were paying 32-times the index’s average earnings to invest in those one hundred companies. If we were at that sort of level today, the FTSE 100 would have to be above 14,000. So despite being at all-time highs, the FTSE 100 is about half as expensive as it was twenty years ago, relative to the profits produced by the underlying companies. That’s backed up by the dividend yield, which is 3.8% today compared to a mere 2.1% near the height of the dot-com boom. All of this suggests, very strongly, that the FTSE 100 is nowhere near expensive by historic standards. And relative to the housing market the FTSE 100 is an absolute bargain (although in reality it’s difficult to make direct real-world comparisons between the two because they’re very different animals). Before we move on to the FTSE 250, here’s a chart showing the valuation bands from the table above along with the actual value of the FTSE 100. 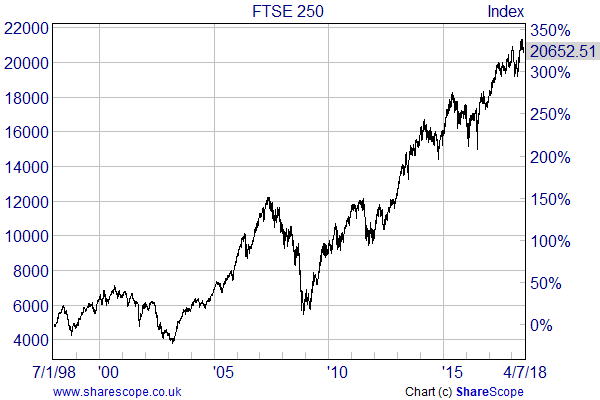 Unlike the FTSE 100, the FTSE 250 has left its dot-com bubble price in the dust (which is because it didn’t really have a dot-com bubble in the first place). As you might expect, this rapid price increase has driven the FTSE 250’s CAPE ratio up to the point where it’s above average. 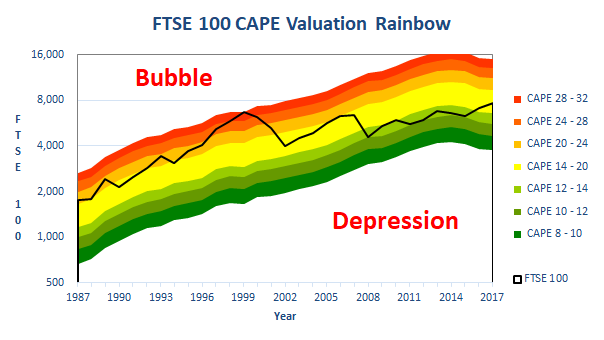 For the FTSE 250, the average CAPE is around 20 rather than 16. That’s because the mid-cap index typically trades on higher valuations than the large-cap index, probably because on average it’s made up of smaller, higher growth companies (and higher growth tomorrow means higher valuations today). 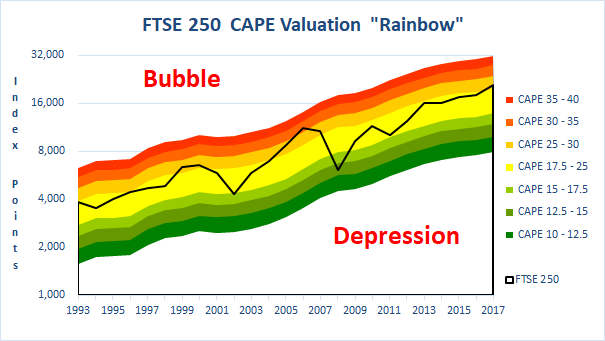 For the FTSE 250, its peak valuation came at the peak of the mid-2000s credit boom rather than the late-90s tech boom. It’s CAPE ratio went above 32 just before the crash and so today’s CAPE ratio of about 24 is warm, but some way short of expensive, let-alone an outright bubble. Interestingly enough, the FTSE 250’s earnings over the last ten years are double what they were in the ten years leading up to the credit crunch, so the index’s higher price is well-supported by much higher earnings. As you can see, the FTSE 250 sits very slightly above the yellow “normal” valuation range, but only very slightly. As I mentioned at the outset, normal CAPE ratios imply normal expected returns over say ten to thirty years. For both indices this means something in the region of 7% per year, on average, made up of both capital gains and dividend income. The “on average” bit is important. Because even if the expected return is 7%, you shouldn’t expect to get 7% every year, or even anything close to that. It’s like playing a game of dice where the odds are stacked in your favour. Roll a one or two and you lose a pound. Roll three, four, five or six and you win a pound. Over six rolls you’d expect to have won four pounds and lost two pounds, giving you a net gain of two pounds. But in reality you might have lost six pounds, gained six pounds, or anything in between. On any single roll your expected return is 33p (two pounds divided by six possible outcomes), but you obviously won’t actually get 33p since you either win a pound or lose a pound. So 33p is the expected return per roll, but you shouldn’t ever expect to get the expected return on a single roll. However, over 100 rolls you really can expect to have won something fairly close to 33p per roll, on average. And the longer you play, the closer your average return will get to the expected return. And it’s exactly the same in the stock market. Over a single year you might lose 20% or gain 20%, but over ten, 20 or 30 years you can reasonably assume your average return will be close to the expected return. You should expect fairly normal total returns from the UK stock market between now and some date at least ten years in the future. History suggests the market will return an average of about 7% per year over that sort of time-frame, given today’s average starting valuation. John, I’m always suspicious about forecasting, especially when it involves the future lol ! More seriously though I think the more valuable measurement, and the one you might gain more opportunity from, is to look at the sectors within the market and assess which are overvalued and which are less so. And then it’s down to the company — it’s always down to the company and the market it operates in. Hi LR, I agree with you to a degree, but I think market valuations and forecasts have their place too. I remember only too well being an index tracking investor back in the 90s who knew nothing about market valuations. The mantra was “stocks for the long-run”, but that only works if a) you realise that the market can fall by 50% or more from expensive highs and b) you can stick with it when the market does fall by 50%, and c) perhaps even load up on stocks when everybody else says you’re an idiot if you do. So I’m trying to give readers a realistic outlook of what to expect, so that they don’t expect 20% gains to infinity and beyond (as many people did during the dot-com bubble). interesting that this suggests the ftse is not overpriced (albeit with no special adjustment for Brexit or trump). especially interesting for those considering transferring out of DB pension schemes. transfer values are high at the moment, and this is largely because the actuaries are forecasting very low investment returns (uk/globally), possibly below RPI. are the wrong to take this view, based on the evidence? how can they be a long way out? Hi David, I’m no expert, but I think the DB transfer values are based more on fixed interest investments (bonds) than equities. And bond yields are at record lows so therefore a large lump sum would be required to generated the pension, and the transfer value is approximately equal to that lump sum. So I don’t know if they’re “wrong” as such to price DB transfers so highly assuming they’re valuations are based on bond yields, but I do think the “expected” return from UK equities is about average over the next ten years or more. Excellent article again John. It might also be interesting to look at the dividend cover for both indices, both of which would support your case, I believe. There are risks with the FTSE100, primarily commodities and a loony left government. But these are balanced by upside opportunity too. Thanks again for another interesting article. Hi Steve, unfortunately I don’t look at AIM stocks. If there are any AIM investors / bloggers out there who want to give this a go, I’m happy to help them sort out the CAPE bands and rainbow chart. Good analysis as ever. Does the analogy with the housing market breakdown given the composition of the FTSE 100 is considerably different now to what it was in 1999 would you say? For what it is worth, I also agree that the FTSE 100 is inexpensive and invest accordingly however, I do wonder as to the longevity of some of the companies within the index. It does appear to have become a value / unloved index? I don’t think changes to the underlying companies matters much. CAPE has been analysed across dozens of countries with data up to and over 100 years and it is very consistent in its mean-reversion tendencies. And yes, the FTSE 100 is very unloved at the moment, probably because of Brexit. However there are clever people on both sides of that argument, with Neil Woodford a notable UK-bull. I think this is a great way to put things in perspective. To add to this perspective it would be interesting to see the same for the s&p500 and Amazon. I have done valuation and forecast posts on the S&P 500 in the past, but not for a long time. Perhaps I should run the slide rule over the much more bullish US market, but I’m sure US investors won’t like what I have to say! As for Amazon, I have been meaning to do an article on it just out of interest, but alas haven’t found the time yet. Hopefully I’ll get round to it at some point because its current valuation implies some pretty spectacular expectations from its shareholders. I do not think there is too much informational value in the past earnings to forecast future earnings. Stock markets try to price future earnings and use a discount rate. The mean reversion is based on the idea that where high earnings are produced competition would be attracted and margins will reduce. If not, the State may intervine to break the monopolies. Google, Facebook and Amazon be aware! This could apply with some sectors, but in a “normal” economy other sectors and opportunities appear where high earnings could be achieved. There are periods of huge advances and inovation and not so good periods. There is no clear science to forecast these. As such, I do not believe in mean reversion, I am more of a random walk type of investor . Hi Eugen, I think it’s both. Market prices and corporate earnings clearly do follow a random walk, otherwise prediction would be easy. However, historic data also strongly suggests that both earnings growth rates and prices relative to those earnings (i.e. PE10 or CAPE) do mean-revert in most cases most of the time. So for me the best mindset for future earnings growth and CAPE is that they will mean revert, but the path to mean reversion will be a largely (but not completely) random one.